Royal coats of arms decorated not only the palaces of monarchs but also the buildings, public or private, of their loyal subjects. They were mostly painted and were often placed next to those of the institution, perhaps a guild hall, school or university college, or indeed those of the owner of a private house. They were positioned where they could be seen, above a doorway, at the top of the panelling of a chamber or on the minstrels' gallery in a dining hall. Larger versions were placed over chimney-pieces. In this example the ornamental frame was probably added at a much later date, so that it could be hung on a wall as if it were a picture. The traces of paint and gesso (a thin layer of plaster) indicate that the coat of arms was originally coloured and gilded, so as to stand out. 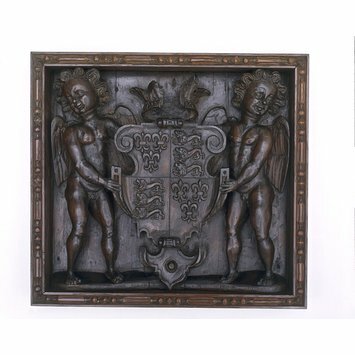 This decoration was probably removed by the 1890s, when dealers and collectors associated objects made in the reigns of Elizabeth I (1558-1603) and James I (1603-1625) with a dark-stained finish. The coat of arms is decorated with strapwork decoration. This was based on strips of leather or ribbons and became known in England through engravings by Netherlandish artists such as Hans Vredeman de Vries (1527-?1606), Jacob Floris (1524-1582) and Cornelius Bos (around 1510-1555). It was widely used until about 1630. 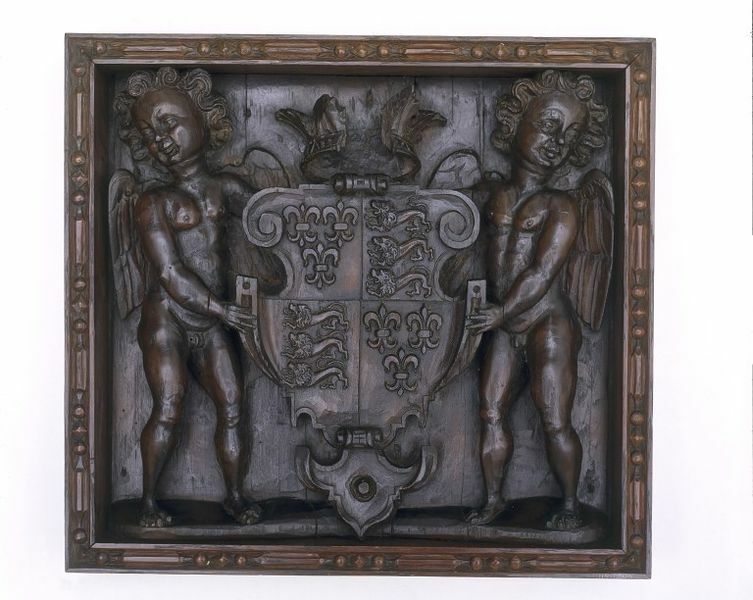 Panel, of plane wood, carved with the Royal Arms of England surmounted by a crown and supported by two cupids. From catalogue H. 14 in., W. 15 ¼ in. Bought for £41 17s 11d from the collection of Mr. G. W. Braikenridge (Christie's, Feb. 27, 1908, lot 113).